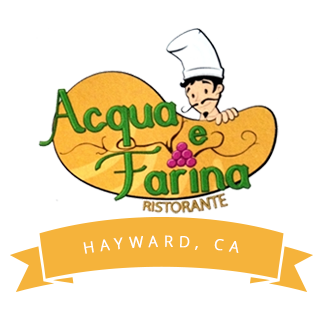 A family-owned Italian Restaurant in the heart of downtown Hayward. 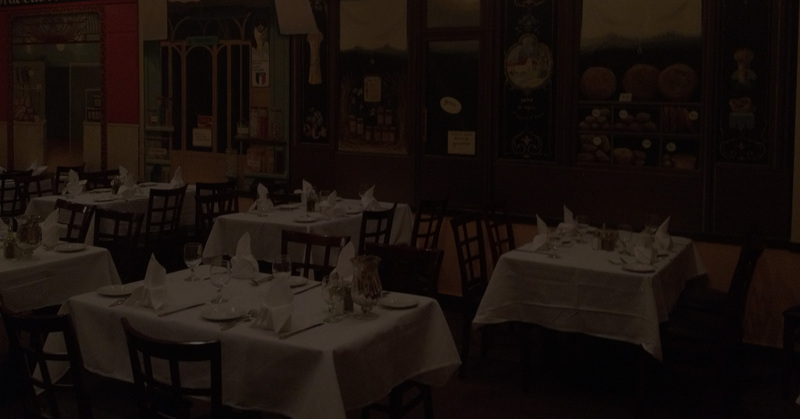 Serving authentic Italian cuisine with a fine wine selection and a wonderful atmosphere. Toasted bread with fresh tomatoes, garlic, olives, extra virgin olive oil. Sliced tomatoes with fresh mozzarella, basil, and feta cheese. 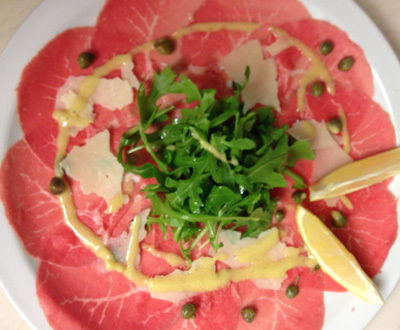 Thin slices of raw beef, capers, mustard, arugula, shaved parmesan cheese, and extra virgin olive oil. Served with cocktail sauce and spicy aioli. Cornmeal fritters baked with mushrooms and Madeira sauce. Chopped tomatoes, onions, arugula, croutons, basil, and fresh mozzarella cheese. Mixed greens with Italian home-made dressing. Iceberg lettuce with bacon, cherry tomatoes, and eggs, in a blue cheese dressing. Mixed greens with salmon, cherry tomatoes, cucumbers, balsamic vinegar, and garnished with fried onions rings. Meatball sandwich with mozzarella cheese and light marinara sauce on freshly baked bread. Grilled chicken breast with lettuce, tomatoes, onions, mayonnaise and mustard on freshly baked bread. Angel hair pasta with garlic and basil in a fresh tomato sauce. Meat tortellini with prosciutto, mushrooms, and peas in a cream sauce. Potato dumplings in a light tomato cream sauce. Stuffed with ricotta cheese and spinach in a meat sauce. Fettuccine pasta with chicken and garlic in a home-made pesto sauce. Risotto with Italian sausage, onions, and mushrooms in a light tomato sauce. Veal crepes with marinara sauce, béchamel, and topped with mozzarella cheese. Linguini pasta with chopped clams and fresh clams in a white wine sauce. Meat lasagna with tomato sauce, béchamel, and topped with mozzarella cheese. Eggplant with tomato sauce and topped with mozzarella cheese. 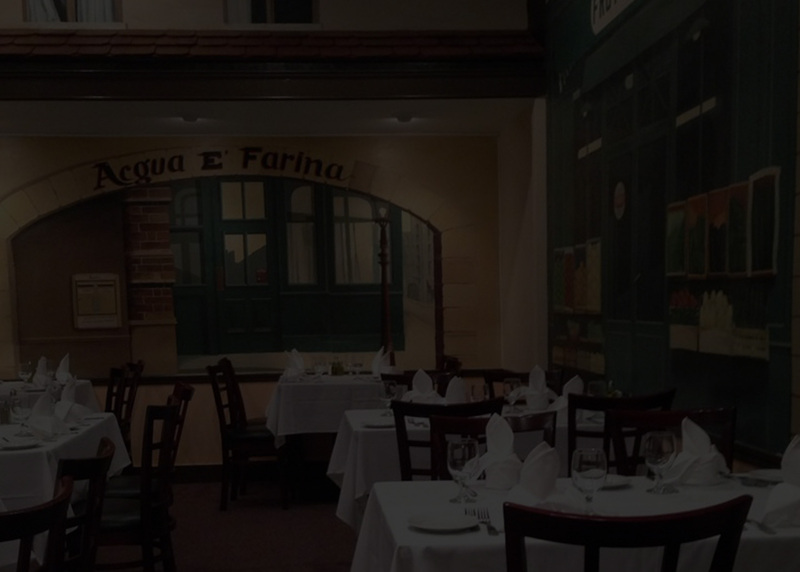 Veal scallopini with sage, topped with prosciutto and mozzarella cheese, in a Marsala wine. Veal scallopini sautéed with mushrooms & Marsala wine sauce. Veal scallopini sautéed with lemon, capers, finish with white wine sauce. Chicken breast lightly breaded and topped with mozzarella cheese in a light marinara sauce. Chicken breast with sautéed mushrooms in a Marsala cream sauce. Calamari steak sautéed with capers, lemon, butter, and white wine sauce. Grilled salmon with garlic, basil, and fresh tomato white wine sauce. Sautéed prawns with garlic, lemon, and white wine butter sauce. Toasted bread with fresh tomatoes, garlic, olives, and extra virgin olive oil. Mushrooms stuffed with seafood in a lemon white wine sauce. 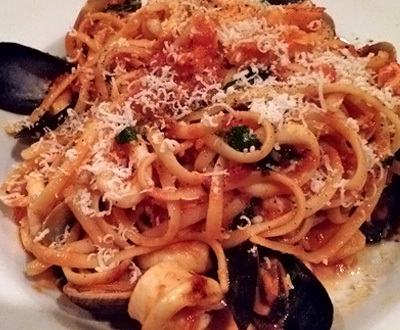 Clams and mussels with garlic, green onions, and fresh tomato, in a white wine sauce. Caesar salad in a home-made dressing with croutons and shaved parmesan cheese. Arugula with fresh mozzarella cheese, tomatoes, onions, basil, and croutons tossed in a home-made Italian dressing. Mixed greens with home-made Italian dressing. Spinach with pine nuts and pancetta in a Brandy dressing. Arugula tossed with fennel, beets, shaved parmesan cheese, caramelized walnuts, cherry tomatoes, and a home-made balsamic vinegar dressing. Home-made Ravioli with spinach and ricotta cheese in a meat sauce. Risotto with chicken, mushrooms, red onions, and peas in a light tomato sauce. Fettuccine pasta sautéed with shrimp, garlic, artichoke hearts, sun-dried tomatoes, and spinach in a cream sauce. 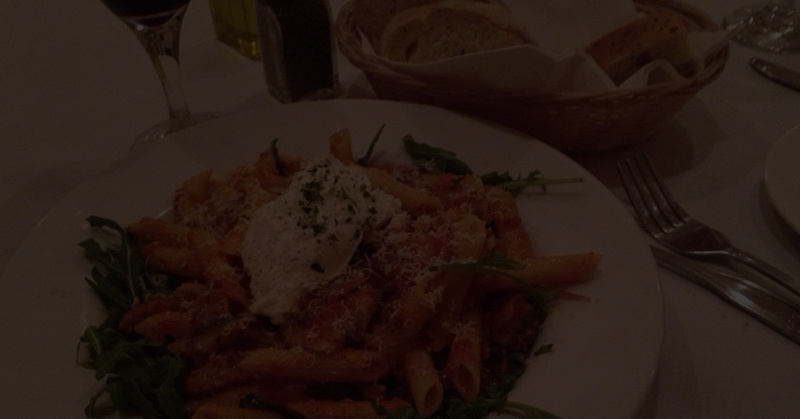 Penne pasta with Italian sausage, red onions, mushrooms, and arugula in a marinara sauce, topped with ricotta cheese. Veal crepes with marinara sauce and béchamel, topped with mozzarella cheese. Linguini pasta with fresh clams and chopped clams in a white wine sauce. Meat lasagna with tomato sauce and béchamel, topped with mozzarella cheese. Marinated with rosemary and garlic. Veal scallopini with sage, prosciutto and mozzarella cheese in a Marsala wine sauce. Veal scallopini sautéed with mushrooms and Marsala wine sauce. Chicken breast lightly breaded, topped with mozzarella cheese, and finished in a light marinara sauce. Chicken breast with capers, in a lemon, butter, and white wine sauce. Chicken breast sautéed with artichoke hearts and sun dried tomatoes with Marsala sauce. Calamari steak sautéed with capers, in a lemon, butter, and white wine sauce. Sautéed prawns with garlic, in a lemon, and white wine butter sauce. Layered lady fingers with chocolate and zabaglione. Chocolate cake with raspberry and dark chocolate. Chocolate gelato with caramelized hazelnuts and cocoa powder. Cappuccino gelato with an espresso flavored filling. Lemon gelato with a limoncello flavored filling. Peach sorbet in a natural peach shell. Creamy homemade Italian custard with raspberry sauce. Patron Silver, Passion Fruit & fresh Juice. Templeton Rye Muddled Cherry Orange & Ginger. Sauza Hornitos, Cactus Juice, Orange Combier & Fresh Juices. Remy Martin vsop, Triple Sec, Fresh Lemon Juice & Sugar Rim. Sauza Hornitos, Gran Manier,Disarrono & Fresh Lime Juice. St. George Green Chile Vodka, Fresh Lime Juice & Passion Fruit Puree. Stoli Ruby Red Vodka, Grapefruit Juice,Agave Nectar & Fresh Lime Juice. Redemption Rye, Raspberry & Orange Juice. Choose Between Standard, Cucumber,Raspberry o Pomegranate. 2013 Ornellaia " La Serre Nuove "